After a long and intensive 3 month Initial Police dog course our 3 newly qualified General purpose Police dog teams shared an enjoyable day with their puppy walkers, friends and family on their passing out parade before starting life as fully fledged Operational Police dog teams. Pictured left to right are PC Mark Stevens with PD Drake ( Previously Larry ) course instructor Steve Dutton, PC Tom Bond with PD Eyke and PC Brendan Trent with PD Ben. Brendan is an experienced handler based at Ferndown Dorset. His old Police dog Vinny retired last year and Brendan was allocated PD Ben from our puppy program to start the course which commenced on January 7th 2019. Tom is also an experienced Police dog handler whose old Police dog Bowser retired last year after a very successful Police career having been placed 7th at the National Police dog trials and also was an elite firearms support dog. Tom is based in North Devon and was initially allocated TPD Sydney from our puppy program. Unfortunately Sydney unexpectedly developed a phobia about walking on certain types of floor surfaces and had to be released from the program. PD Eyke from our E litter was then drafted in at the tender age of only 11 months and started with Tom on the second week of the course. Mark is also an experienced handler who is based at Ashburton. 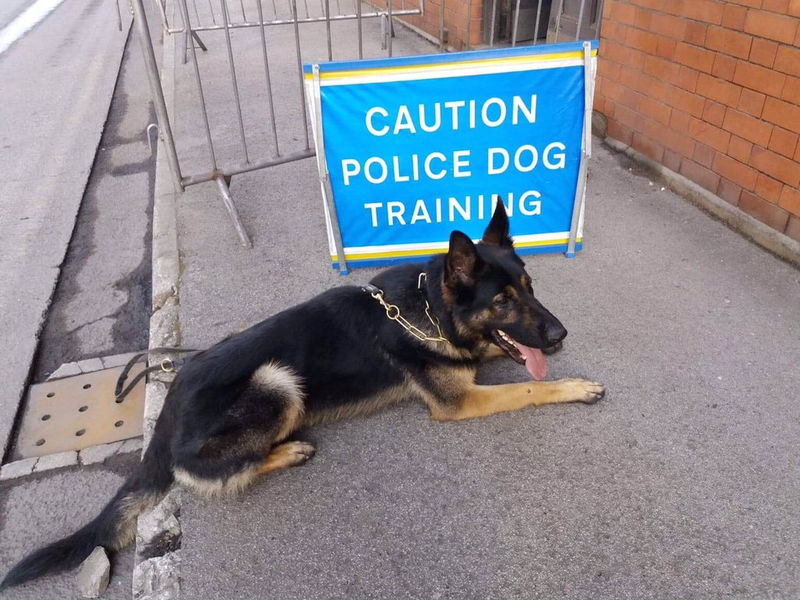 After his very successful Police dog Axel retired unexpectedly at the age of 5 last year with a spinal complaint Mark completed an Initial Police dog course with PD Brock in December 2018. With regard to PD Brock he has responded well to additional remedial tracking training with Instructor Graham Attwood and Graham is confident that he still has a future as an operational Police dog. Although the start of the course was somewhat disjointed with PD Eyke only starting in week 2 and PD Drake ( Larry) starting in week 3 the standard of the 3 dogs at the end of the course was outstanding. That is entirely down to the quality of the 3 dogs, the hard work of the handlers and an excellent Instructor in Steve Dutton. Considering that this was his first full General Purpose Initial Police dog course the standard that he has achieved is exceptional. Also we shouldn’t underestimate just what a huge part our puppy walkers contribute to their development. Here is puppy walker Rob working on Eyke’s recall as a young puppy. Here he is at 11 weeks going over an agility ramp at the Devon county show. Here is puppy walker Lyn with 11 week old Ben starting his tracking training. I went out with the course in the early weeks and at the hallway stage but I was on holiday for the last 3 weeks and missed seeing them undergoing their licensing assessments in the penultimate week. I did however get to go out with the course on their final training day 2 days before their passing out parade. To see them all doing practical operational training tracks on a busy housing estate was very impressive. Here is Eyke tracking with purpose and determination. Here he is telling his handler Tom that he has located an article hidden under some grass which I couldn’t see even though I knew where it was. Here is Eyke enjoying his ball at the end of his track. Instructor Steve and Tom debrief and discuss the track but Eyke just lets them get on with it because he’s got his ball and he is more than happy with his performance. Over the 13 week course the teams cover tracking and searching for outstanding criminals and vulnerable missing persons, searching for lost property or discarded crime items, dealing with violent disorderly crowds, detaining fleeing criminals, dealing with violent criminals, developing their agility and a wide range of control exercises which underpin all of their work. Without doubt the number one exercise is tracking which is the dog’s ability to follow accurately a trail left by a fleeing criminal or vulnerable missing person. That is why we start this exercise with our pups as early as 11 weeks old. Here is Brenden and Ben tracking on the same housing estate and again you can see the determination to complete the track and if possible locate the offender or missing person. Here PD Ben is telling Brendan he has located an article which has been discarded by the person who he is following. Our dogs are trained to indicate the article passively without touching it to preserve any DNA that could connect the offender to the article and crime scene. It was an especially proud moment for me to see Mark and PD Drake performing so well. I imported PD Drake ( Previously Larry) from Holland aged 15 weeks and intended for him to be my own dog. He never disappointed me and lived with me, my wife Di and our female dog Ella. I trained him to track but realised early on that he was a dog who was born to work and wanted more than I could ever give him because of my busy life supervising and supporting all of the pups in our puppy program. Mark needed a dog and knowing how successful he had been with his previous dog PD Axel I knew it was the right decision to let him go to Mark. It was quite an emotional day for me but enjoyable to see how well they had bonded and also seeing the spring in Mark’s step which I hadn’t seen for a while with the recent tough times he has been through. They never put a foot or paw wrong on the track and were a pleasure to watch. Back at HQ I saw all the teams doing their use of force exercises which includes the straight chase and attack of a fleeing criminal. Here is Drake detaining the criminal with tremendous speed and power. All of the dogs are extremely committed in their attacks but equally the handlers all have excellent control over their dogs. Here is PD Eyke doing a stand -off exercise. This is where the criminal runs away and the dog is sent to detain him/her. If the criminal stops running and gives up before the dog gets to him/her the dog is trained not to bite but to guard the criminal until joined by their handler. Here is PD Eyke maintaining observations on the criminal while handler Tom searches the criminal for evidence or any weapons. This is PD Drake doing the stand-off exercise and you can see quite clearly that if the criminal does not do as he is told there will be a consequence. They all have their own way of doing things Ben on the stand-off exercise likes to have a conversation with the criminal telling him to stay where he is. PD Eyke is particularly amusing to watch doing his criminal work because not only is he very determined in his attack but if you look closely he makes doubly sure the criminal cant escape by wrapping his paws around his leg. After the criminal work the teams did some group obedience work. I was very impressed with all that I saw and I took a final picture of the teams at the end of their last training day on the January 2019 General purpose Initial Police dog course. The following day the course were practising for their passing out parade on the Thursday. This is the day where we traditionally invite the puppy walkers, family and friends to share the handlers final day before leaving to commence work as operational Police dogs. Here they all are the dog teams with their puppy walkers who have made it all possible. Left to right are PC Mark Stevens with PD Drake, Course Instructor Steve Dutton, PC Tom Bond with PD Eyke and PC Brendan Trent and PD Ben. It is always a special day for our puppy walkers to see their dogs successfully passing out as operational Police dogs after all the work they have put in and because of the incredible bond they have with their dogs. As always we had an excellent attendance and it always impresses me how many of our off duty dog handlers turn up to support their colleagues on this special day. In my time on the dog section the senior management have always been very supportive of their dog section and today was no exception. ACC Paul Davies who has been out several times with the course to see them training kindly attended to support the event and to present the licensing certificates to the handlers and framed pictures of the dogs for our puppy walkers. To start the passing out parade the team’s first gave an excellent demonstration of group obedience. Considering the dogs have never performed in front of a large crowd I thought they were all excellent. Next Brendan and PD Ben gave a demonstration on the agility equipment and then demonstrated their stand-off exercise. Brendan then gave a demonstration of PD Ben doing the stick attack. Next Tom gave a demonstration with PD Eyke negotiating the agility equipment, then the chase and stand- off and then the chase and detain. Tom then finished with PD Eyke dealing with the gun criminal. Mark and PD Drake then gave what I thought was an exceptional demonstration of searching and locating 3 small items of property on the football field. To maintain his concentration searching for 3 small articles in front of a large crowd having no doubt heard the other dogs previously doing their criminal work and hearing the shouting and gun going off was for me simply outstanding and confirms what I have always thought that he will be an outstanding and special working dog. After completing the property search Mark then included a chase and attack as a reward for PD Drake performing so well on the property search. Mark then finished his display by sending PD Drake after a fleeing criminal and attempted to do what is called an emergency recall where the dog is required to terminate the chase and return to the handler. In training he always achieves this most difficult exercise but on this occasion obviously was confused with the different circumstances and didn’t recall but went on to complete the chase an attack. I have no doubt given more experience he will go on to perform this exercise to perfection in all circumstances. As always the puppy walkers, families and friends really enjoyed seeing their dogs showing off all the skills that they have learned and I thought the display was excellent. After the display we stopped to take photographs of all the teams with their puppy walkers, family and friends. Here is Tom and PD Eyke with his puppy walking family Rob, Lisa, Erin and Belles. There is no doubt that the family absolutely loved PD Eyke but he was a real handful and with Lisa not being in the best of health in the latter months it was a real struggle for her managing him during the day when Rob was at work. The family attended all of our puppy development classes and they all took turns training him. Here is Lisa demonstrating his down stay when he was only 5 months old. Eyke has a lovely temperament but having watched him develop in the litter I always knew he was going to be a challenge even for an experienced puppy walker. Unfortunately I didn’t have an experienced puppy walker available and so I placed him with Rob and his family in Exeter so that I could keep an eye on him. They did an excellent job. Even handler Tom has had to use all of his considerable skills moulding and harnessing the energy and drive of this spirited young dog. I have no doubt that PD Eyke with Tom’s guidance will go on to fulfil his tremendous potential. To give the family a well-earned break retired Police dog handler and seasoned puppy walker Eamon Rogers and his wife Karon very kindly agreed to look after PD Eyke for the last month before he was allocated to Tom. Here is PD Eyke and Tom with his wife Selina and daughters Madeline and Holly. We wouldn’t normally start a course with a dog as young as PD Eyke but I knew fast tracking him from the September course would be no problem to him. PD Eyke is the first to graduate from our E litter but I have no doubt having seen his littermates Errol, Ernie and Echo on our last training day they will soon be following in his footsteps. PD Ben was bred by Lorokmor working dogs in Shropshire and came to us at 8 weeks along with his brother Bill. His first puppy walkers were Lyn and Dave Vooght but as they were on holiday when we collected him one of our regular helpers Mary Downs looked after him for the first 2 weeks. He then went to Lyn and Dave who did an excellent job looking after this energetic enthusiastic young dog but Lyn’s health took a turn for the worse and so after 4 months we had to find him a new puppy walking family. I always try to explain to any prospective new puppy walker that the type of puppy we need to be a successful Police dog is going to be a real challenge. This is because they are highly driven, energetic, determined and sometimes very excitable and when they get to 8 months are extremely powerful. That was certainly the case with PD Ben but he met his match with the James family in Plymouth. Here he is with Jacob, Lexie, mum Wendy and Lauren. Unfortunately Dad Stuart couldn’t make the pass out as he had an urgent hospital appointment. As previously mentioned in my blog I imported PD DRAKE from Koos Hassing of the famous Tiekerhook kennel in Holland when he was 15 weeks old with the intention of puppy walking him myself. The timing wasn’t particularly good because at the time Sasha was raising her E litter at our house and her pups were only 3 weeks old. Our friends and previous puppy walkers Angie and Graham Collins kindly agreed to look after PD Drake for us until the pups were allocated to their new puppy walkers at 8 weeks of age. Here is Mark and PD Drake with Angie. I've brought up many dogs over the years and it is always difficult when they then go on to their handler and so I know how hard it is for our puppy walkers. But letting PD Drake leave me is the hardest yet. But I have no doubt having seen Mark and PD Drake working together it was the right thing to do. PD Drake has grown up with my own female Ella and at the time of writing this blog Ella has come into season and I am considering using PD Drake as the stud dog for her first litter. The pair were inseparable when they were together. After photographs we all then retired to one of the presentation rooms in HQ where ACC Paul Davies presented the General purpose Initial Police dog licenses to our 3 handlers and presented a framed photograph of each dog to all the puppy walkers. Here are puppy walkers Wendy, Lauren, Lexi and James pictured receiving their picture of PD Ben. The puppy walkers play such a vitally important part in raising our pups and give them the solid foundations which will serve them well on the next stage of their journey as operational Police dogs. We all then tucked into the buffet and had a good old natter. As always one of our helpers Mary brought her own extra supply of cakes and supplies. It all then got a bit raucous with Mary trying on a Police officer’s hat for size. But having helped out with 19 pups when people go on holiday over the last two years I certainly wasn’t going to tell her off. Then it was time to disperse after another excellent passing out parade. We have been doing these for over 30 years and long may they continue. The eagle eyed amongst you will be wondering what happened to TPD Bill who started the course with his handler Kevin. Instructor Steve and Kevin realised that despite Kevin giving it absolutely everything dog handling was probably not the role for him. Kevin didn’t want to hold TPD Bill back and continued to look after him until a handler could be found. We didn’t have a handler in force and so TPD Bill is now continuing his Initial course training with a very experienced handler Lee Schofield in South Yorkshire and is doing very well. Lee tells me his tracking is exceptional and everything else is going really well. Bill is pictured here reinforcing the health and safety message. I think without exception all of us on the dog section wish Kevin well in the future and we are all disappointed that it didn’t work out for him. He was extremely popular and I will remember the many laughs and good times we had with Kevin. It certainly wasn’t for the want of trying and I wish you well Kevin in whatever you do. From Ella and I see you next time.